Here are two pictures from our archive of photos and documents. We have interviewed more than a dozen former farm workers and UFW activists, including Tomas Villanueva, co-founder of the UFW Co-op and first president of UFW of Washington State. 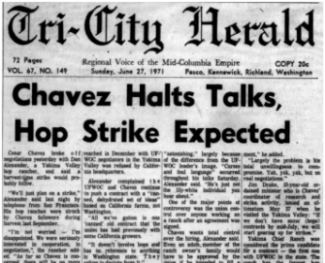 This article, signaling the start of the 1971 Yakima hop strike, is one of nearly 500 newspaper articles that we have digitized. Our News Coverage archive is a unique resource for exploring the activities of the UFW and other farm workers movements in Washington State from 1933 to 2002. The modern farm workers movement began in California in 1965 when Mexican American workers led by Caesar Chavez joined with Filipino American workers led by Larry Itliong to strike Delano grape growers and launch what later became the United Farm Workers. 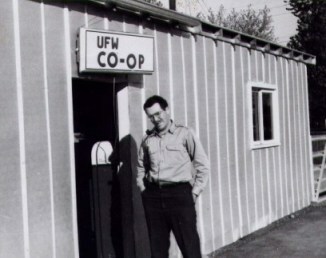 It came to Washington State two years later with the founding of the UFW Co-op in the Yakima Valley. The movement quickly became, and remains today, something more than a labor union. The struggle to win basic rights and improve work and living conditions for farm workers represents a struggle by and for some of the most disadvantaged among us. Farm workers are unique. No work is more important than growing the food that we all consume. And few workers have been so ill treated by the society that depends upon them. Dangerous work, minimal pay, jobs of short duration, inadequate housing, poor sanitation, and exclusion from many of the social and political institutions of established society–these have been standard conditions for those who work in the fields. The fact that many farm workers are recent immigrants compounds the disadvantages. The movement that took shape around the UFW has had an impact that goes far beyond the men and women who work the crops. The activism of farm workers in time became a powerful symbol that galvanized many causes, not just labor rights but also immigrant rights, Chicano pride, and other struggles for social justice. The farm worker movement that Cesar Chavez started in California ultimately touched us all. This multi-media special section details and documents the history of farm workers from the 1890s to the present and explores the labor activism and political activism that has been associated with agricultural workers. Much of the project focuses on the years since the UFW’s founding, but we also look at earlier generations, including campaigns by the Industrial Workers of the World in the early 20th Century, and Filipino led farm labor unions after the 1930s. Links above and below lead to oral histories, photographic collections, rare documents, a detailed narrative history, and an archive of nearly 500 digitized newspaper articles written about farm workers since 1933. 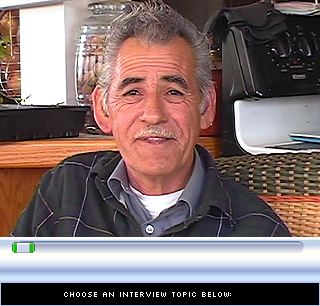 Video Oral Histories We have interviewed more than a dozen former farm workers and UFW activists. Choose and watch parts of those interviews. Photographs and Murals: including pictures from the Tomas Villanueva collection, Jesus Rodriguez collection, Rosalina Guillen collection, and Oscar Rosales Castañeda photos of Seattle Murals. News Coverage 1933-2002: We have digitized nearly 500 newspaper articles that appeared between 1933 and 2003. Browse the year-by-year database. Click and read articles about farm workers and their unions. Documents: Here are digital copies of important publications and documents. For teachers: See the Grape Boycott at UW Lesson Plan for middle school and high school classes. A second grant from the Bridges Center allowed Oscar Rosales Castañeda to continue work and additional funding from the Center for the Study of the Pacific Northwest made it possible for Maria Quintana to help finish the section. Stephanie Adler, Michael Schulze-Oechtering Casteñada, Angelita Chavez, Anne O’Neill, and Edgar Flores also contributed. Section Coordinators: Maria Quintana, Oscar Rosales Castañeda, Sharon Walker. James Gregory and Erasmo Gamboa are co-Directors of the Farm Workers in Washington State History special section.